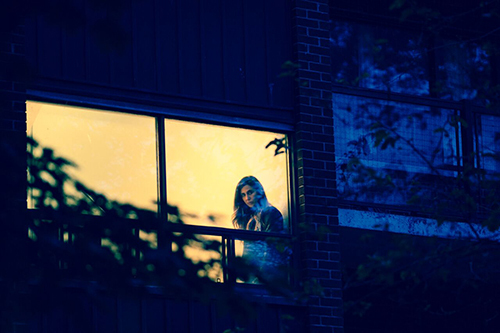 Theatre Mischief‘s A Girl Lives Alone, playing at the 2018 Toronto SummerWorks Festival, is somewhere between a horror movie and a comedy; somewhere between Law and Order and Friends. Using many of the tropes that made vintage horror radio shows so enticing, in particular, the use of live sound effects, this show will make you hoot with laughter and keep you on the edge of your seat. A Girl Lives Alone revolves around Marion (Samantha Madely) the newest resident into an old apartment building. She chose what could easily be the worst time to move in — a body’s been discovered, that of Grace (Tiffany Deobald), a young actress. While everyone’s reeling from the discovery and trying to get back to their normal lives, Marion tries to settle in. However, her passion for all things horror means she can’t ignore the crime at hand and commences her own investigation, one that leads her to the man upstairs, a sound effects (known as ‘foley‘) artist (Andrew Musselman). One of the first things that drew me into this show is how well the cast is able to use the stage. The set is incredibly minimal, bare basic pieces and backdrops are moved in and out to signify various rooms within the building. The cast moves in and out of these spaces using the central area as the main staircase with ease. The invisible walls around them are definitive. Of course what sells A Girl Lives Alone the most is the great use of sound effects with Musselman providing the necessary foley artist elements to deliver the story when he’s not playing his character. From the doors opening and closing, feet on the stairs, and the sounds of a finicky dryer in an old building, Musselman’s work is kept off to the side but clear to see. The acting here is also great. Madely delivers a solid performance with her character Marion, her awkwardness and physical ticks and habits sell the role. She plays well off of Janet (Jessica Moss), the girl next door with her own sense of awkwardness and idiosyncrasies that make her a lot of fun to watch. Both their talents for physical comedy are put to great use within this show. I also loved Musselman not just as his role providing the sound effects but by his performance of the creepy guy upstairs with the weird hobby. There’s a great Hitchcock vibe throughout this show and much of it comes from his character. His ability to lure, intrigue and then terrify Marion is spot on. It was clear with the roars of laughter from the audience that A Girl Lives Alone is a hit. I loved it and I’m sure you will, too. A Girl Lives Alone plays at The Theatre Centre – Franco Boni Theatre (1115 Queen St W). SummerWorks tickets are now Pay What You Decide at $15, $25, or $35, whichever suits your budget. All tickets are general admission and there are no limits to any price level. Tickets are available at the performance venue (cash only), online, by calling 416-732-4116, and in person at the SummerWorks Central Box Office – located at The Theatre Centre (1115 Queen Street West), open August 9-19 from 12pm-8pm. Cash and credit accepted. Several money-saving passes are available if you plan to see at least 4 shows.